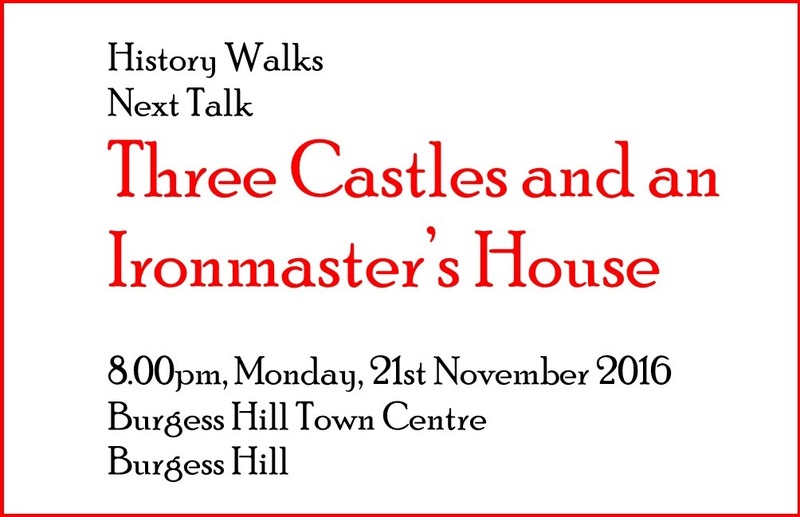 Share in the history of 1066 and the night before the Battle of Hastings with walks to King Harold’s Camp on Caldbec Hill, Duke William’s camp on Telham Hill and to the infamous site of the ‘Malfosse’, the Saxons last ditch attempt to defeat the Norman horde. These two walks form a figure of eight that is designed to allow a little recovery time from the magnificent views and the sometimes steep terrain around Battle. 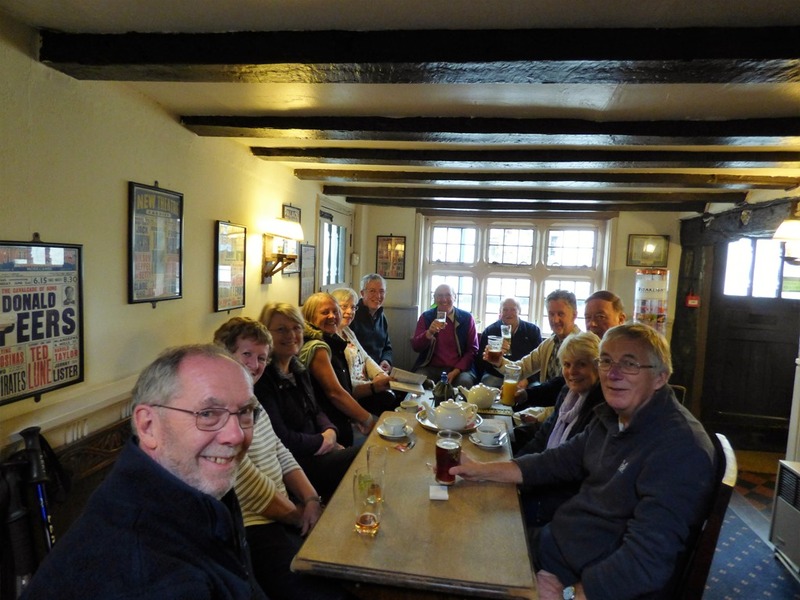 They also form the ideal basis for two short Pub Walks with Walk 1 finishing at either The Kings Head or The Bull and Walk 2 completed with a pint at either The Senlac (handy for the station), The Chequers or The Abbey. Catch the train or bus home and it would be the perfect end for a couple of perfect weekend walks around Battle. More than just Footsteps on a Path. Imagine 1066, the Battle of Hastings and King Harold’s epic journey to his date with destiny. Imagine being part of King Harold’s army, did it rain, was it dry? Three days of marching, the nights were drawing in, the noise, the fear and a battle to face – a camp at Rochester, a camp at Bodiam and a final climb to Caldbec Hill. For the 14th October 1066 is one of the most emotive dates in English history and Harold’s march to the Battle of Hastings is the stuff of legends. Follow in King Harold’s footsteps, along the probable route to the Battle of Hastings, a walk that starts at Westminster Abbey and finishes at Battle Abbey, East Sussex. 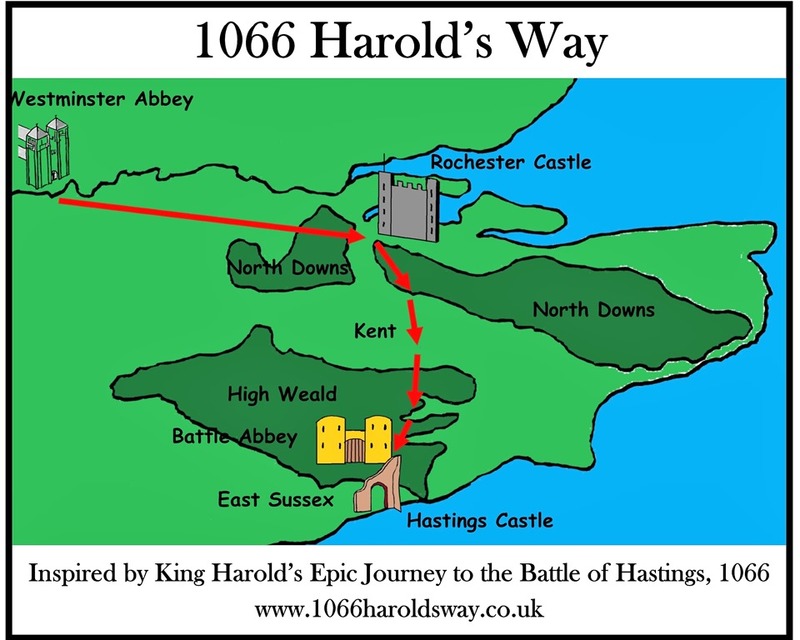 Be part of 1066 Harold’s Way – the start of your adventure. The 14th October 1066 is one of the most emotive dates in English history and Harold’s march to the Battle of Hastings is the stuff of legends. You too can follow in King Harold’s footsteps, along his most likely route to the Battle of Hastings, by walking 1066 Harold’s Way, a walk that starts at Westminster Abbey and finishes at Battle Abbey, East Sussex. You can be part of the legend of King Harold II. Accessible by public transport, there is nothing to stop you sharing the experience of 1066 Harold’s Way, through London, Kent and East Sussex. The guidebook for this 100mile long distance walk is readily available from Waterstones, Amazon, Foyles and other bookshops. 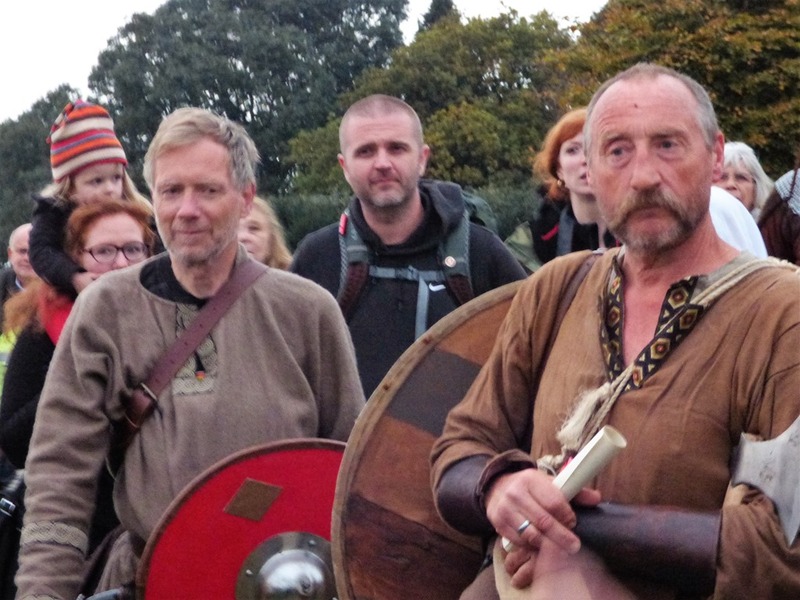 “Marching all that way from Stamford Bridge and I haven’t got the energy to chase after Bill and his Normans” so said Peter Wheeler at the end of YOMP1066, their contribution to the 950th Anniversary of the Battle of Hastings 1066. It was an epic adventure, even awesome, with the route of 1066 Harold’s Way followed from London, but at some cost – the blisters were to be seen to be believed. 35 mile days when 30 miles seemed easy and the final 20 miles from Sissinghurst almost a walk in the park. Planting an apple tree on Caldbec Hill was a masterstroke of forward planning as, one hopes, it will be an old ‘hoar’ apple tree in 50 years time and the meeting point for all Anglo-Saxons. Well done to Peter and his men and eager to get to the beer, supplied by FILO, and I waited for a few minutes before presenting Peter with his certificate. 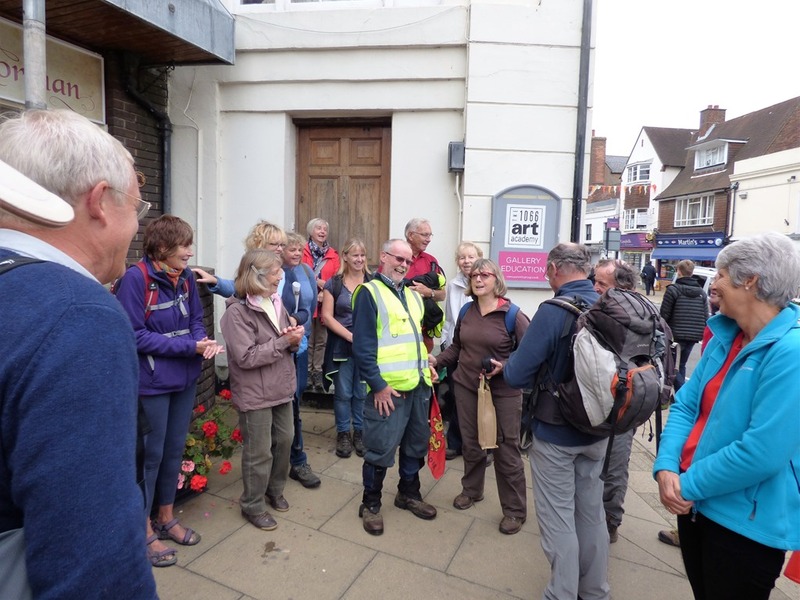 It was a busy time on the path from Bodiam Castle as both Battle 41 Club and Battle Ramblers decided that they would celebrate the 950th Anniversary of the Battle of Hastings by walking the final section of 1066 Harold’s Way. A logistic nightmare as the public transport links between the two would take up more than half a day but all was well after a certain amount of ferrying about. Battle 41 Club ‘walked the walk’ on Thursday, with a detour to Caldbec Hill to view the camp site on what would have been the night before the battle. Battle Ramblers walked on the day of the Anniversary, no doubt to avoid the bloodshed of car drivers stuck behind the various parades. 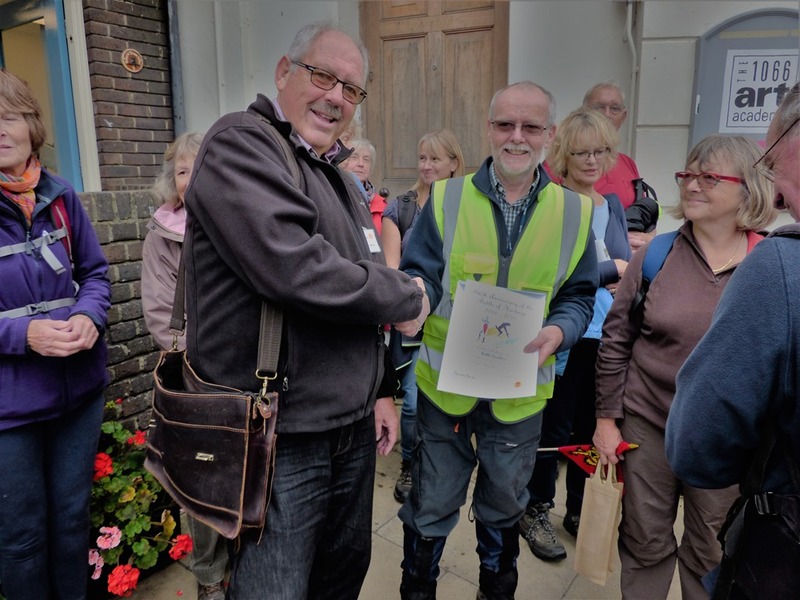 Ramblers from far and wide – London, Bexhill -joined the group as did the enemy no doubt on a reconnaissance mission or they got lost on their way from camp in Hastings. 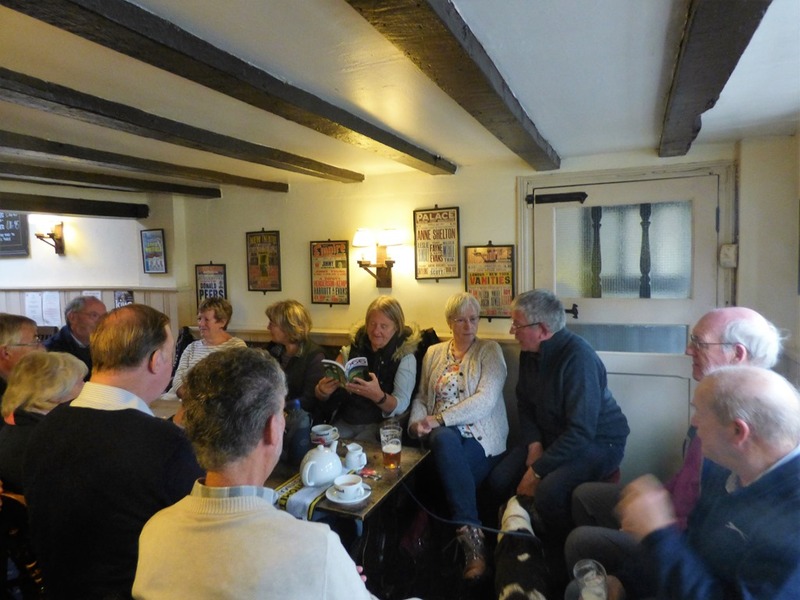 This group of ‘Randonneurs’ from Falaise thoroughly enjoyed the walk and were pleased to receive a copy of 1066 Harold’s Way from the author. 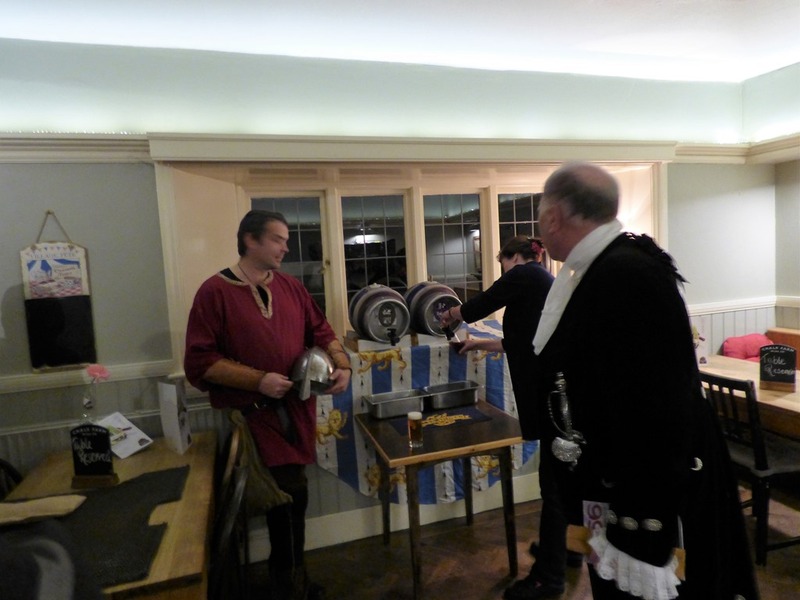 Certificates were presented to Battle 41 in The King’s Head and to Battle Ramblers outside Costa! Many thanks to all those of you who joined us on Harold’s Way including spouses and friends and other 41 Clubbers who were there in spirit. It was an offer that I could not refuse. 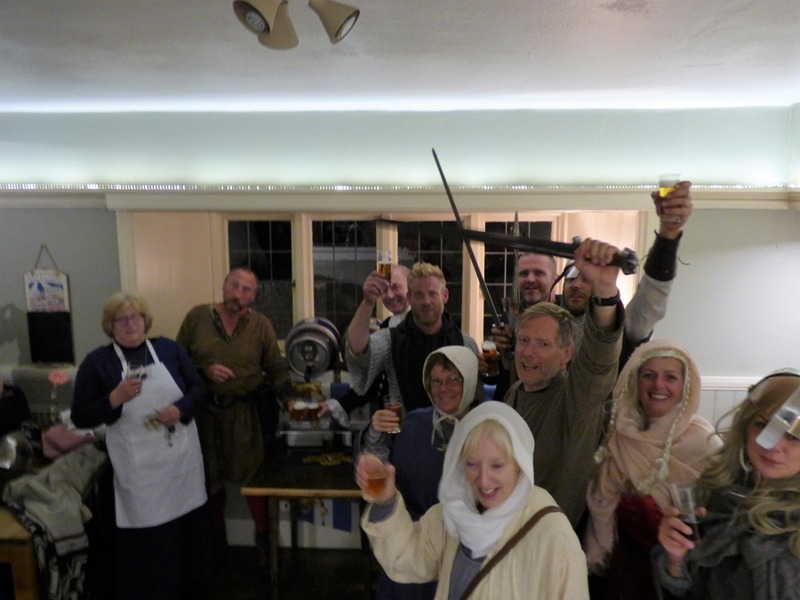 It was all so Anglo-Saxon, recounting tales of battles past at the end of a long march, the ‘fyrd’ sitting together, drinking together and sharing stories of that day’s march from Rochester. Thirty miles they had marched with the final twenty miles set for today, 13th October,to their camp at Caldbec Hill. As events unfolded, it would prove to be the day before the Battle of Senlac Hill against the Norman horde. 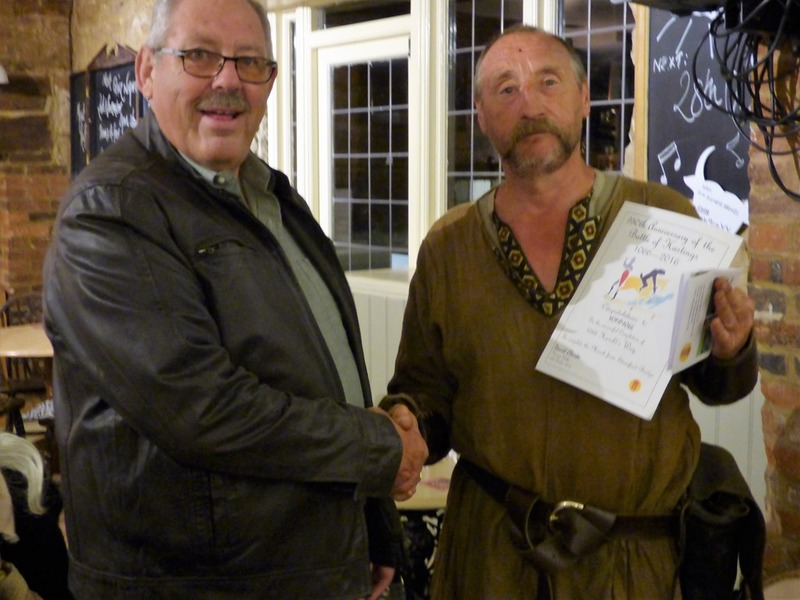 But this was not 950 years ago but last night and I was privileged to be asked to talk to Peter Wheeler’s YOMP1066 on their journey from Stamford Bridge to Caldbec Hill. Today they will plant an apple tree that they hope will last for 50 years when it will truly be ‘the old hoar apple tree’ on Caldbec Hill and the Anglo-Saxon rallying point for the 1000th Anniversary of the Battle of Hastings 1066. I stood and talked of all things Harold and as my Saxon Times alter ego, Brother Eadwine of Canterbury, I gave them foresight of things to come, of battle news and sadly the demise of the King. What happened to the King’s body remains a mystery despite the best efforts of the Saxon Times reporters to discover the truth – maybe Lady Gytha is a Peace Weaver after all. There was of course a cautionary warning that the expected reinforcements for the loyal fyrd had regrettably been delayed – the latest report was that they were lost in the Forest of the Andreasweald after leaving Tonbridge. It is rumoured that they had received false instructions from Norman sympathisers, collectively known as English Heritage, no doubt hoping for some recognition from Duke William himself. It was all good fun and I was home for supper. This is transcript of my letter to BBC History Today in response to an article entitled ‘ Historians are to follow in the footsteps of King Harold’ on an English Heritage walk from York to Battle. 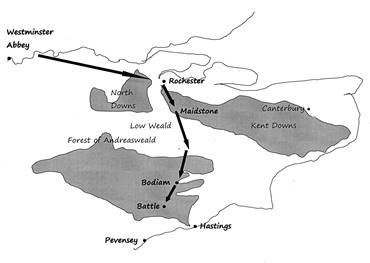 There are many walkers and walking groups who have enjoyed walking 1066 Harold’s Way on what I believe to be the most probable route for King Harold on his epic march to the Battle of Hastings. Your comments are more than welcome and if you feel able to share this blog and Facebook post amongst friends and/or fellow walkers it will add to the debate. It is not the march from York to London along Ermine Street that is subject of discussion but the simplistic view of the route from Westminster Abbey to Caldbec Hill that ignores the conflicting views of scholars and historians. After Tonbridge, and the end of the Roman road, the vast forest of the Andreasweald, the limited tracks, the climbs, descents and the Wealden mud to cope with would have debilitated any army. In my research for 1066 Harold’s Way, a Channel 4 documentary, some years ago, gave a thorough and logical argument for an alternative route along existing Roman roads, east out of London along Watling Street and south along the clear Roman road towards Hastings, with the added legend of a camp at Rochester on the night of 11th October 1066. Those Roman roads across country still exist, contradicting Nigel’s view that the roads are all gone, and they would have been in use in 1066. Although the distance was longer, the easier terrain would have provided a fast and less demanding route across the Weald with the army in a better state to fight a battle. I understand the altruistic view of a route that takes in more EH properties but I would suggest that this march does not entirely follow in the footsteps of King Harold. Indeed, by taking this route it is quite likely Harold would have been late for his own death!